Manchester City made it five wins from five with a comprehensive 6-0 demolition of winless Doncaster Rovers at the Academy Stadium. City started brightly in front a bumper bank holiday crowd of 2,227 as they sought to extend their lead at the top of WSL. However the games first chance fell to Doncaster’s Jess Sigsworth on seven minutes as she took advantage of a Steph Houghton slip, but with Abbie McManus covering, the Belles forward took a touch too many and could only toe poke wide. It would prove to be a costly miss as City took the lead 60 seconds later when a cross field pass found Lucy Bronze on the right hand side and she calmly stroked it into the bottom left hand corner. Two minutes later Jill Scott doubled City’s lead as some terrific interplay released Demi Stokes inside the six yard box; her shot across goal was cleared away but only as far as the City midfielder Scott who rifled the rebound into the goal from the edge of the penalty area. City continued to dominate with Jane Ross, Kosovare Asllani and Toni Duggan all going close with Nicola Hobbs in the Doncaster goal and the woodwork providing the only intervention. However there was only so much the Doncaster goalkeeper could do and having pushed a wicked curled effort from Scott round the post she was finally beaten again on 41 minutes. From the resultant corner, Nikita Parris Rose highest as her headgear cannoned the underside of the crossbar allowing Ross to head home on the line. 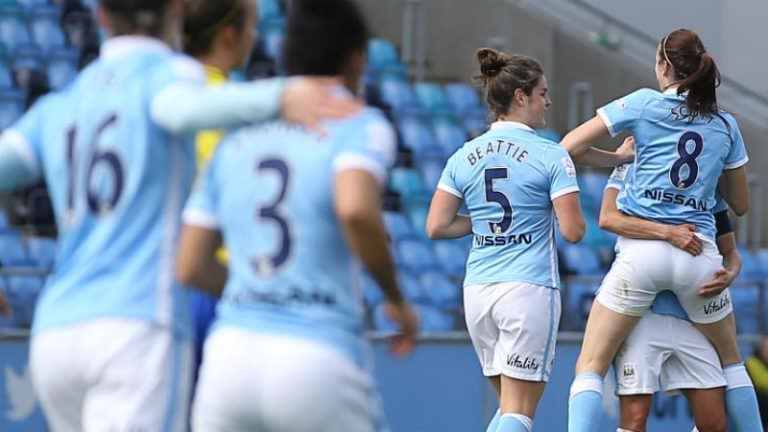 The first half would get worse for the Belles as Jennifer Beattie added a fourth heading home from another corner before Kosovare Asllani scored her first City goal since a winter move from Paris St. Germain! both in first half stoppage time. A wonderful cross field pass found the irrepressible Nikita Parris on the right hand side and the England international fired a low cross along the six yard line for the Swedish international to tap home on the line to give City a commanding and deserved 5-0 half time lead. The second half would fare little better for the Belles as Parris went close again clipping another header of the top of the cross bar but the only surprise was that City added just one further goal when Parris again turned provider as another angled pass from the right wing found Toni Duggan at the far post and she tucked inside for her second goal in two games. City had further chances to extend their lead even further with substitute Daphne Corboz and Duggan both having shots blocked by Rhiannon Roberts before Demi Stokes flashed a third attempt wide. Bronze almost added her second with the last kick of the game as she cannoned a half volley of the top of the crossbar.